Resin kits, originally from Poland, now made in Germany. Silesian also has a line of accessories. 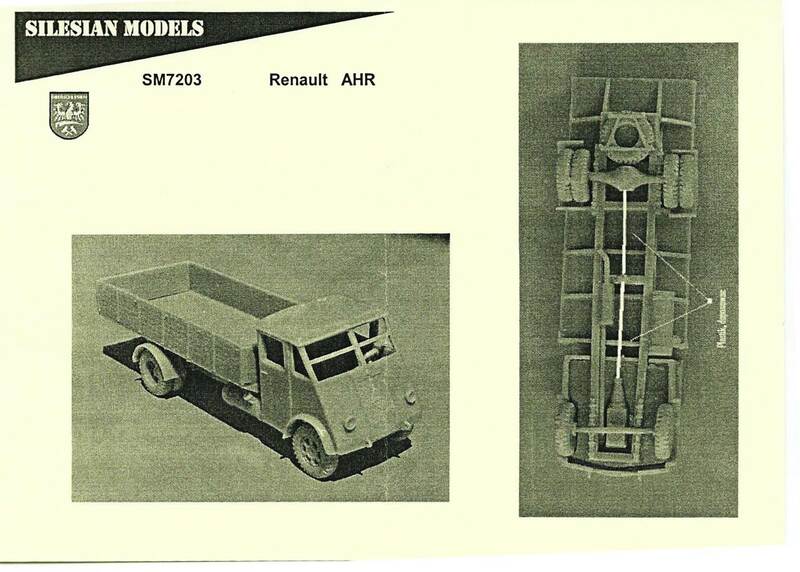 7203 Renault AHR Holzpritsche With just 11 pieces, it isn't hard to figure out what goes where with this kit, but the instructions are pretty disappointing nonetheless. The instructions note that the builder must supply the drive-shaft. Presumably, this requires two pieces of thin rod but the number of pieces needed isn't clear from the instructions. You'll have to fit it together to figure that out. For the premium price, I expected a presentation more like that of a Wespe kit. Perhaps, with the investment comes the expectation that the builder knows all about the vehicle. Also not provided are decals, clear film for the windows, any significant interior details for the cab (there are two seats molded in place, but no steering wheel), or a cover for the truck bed. It's a no frills kit, which just provides you with the basic vehicle to adorn as desired. It would have been nice, if some information on the vehicle were provided, such as its use or non-use in French and German service.